A New Raid Event, Skyborne Spectacle, Is Now Live! Up to four players with four adventurers each (up to 16 adventurers in total!) 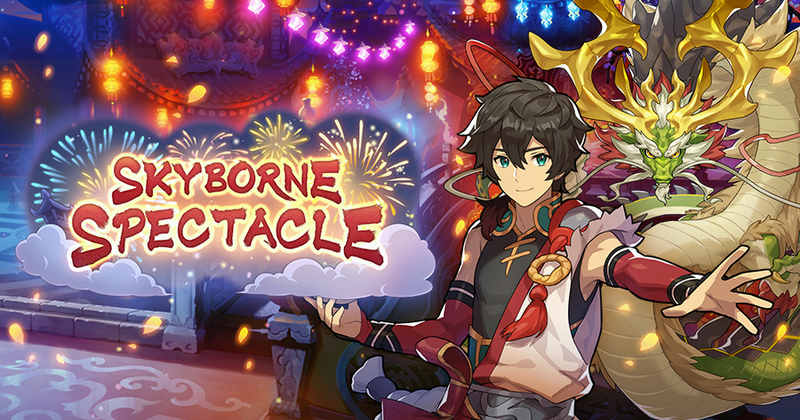 can battle together in the Skyborne Spectacle raid event, which began Jan 30 22:00, 2019(PT). Take on event-specific quests to defeat the water raid boss and earn rewards! The prince and his friends have come to a town that will be celebrating the Lunar New Year. There'll be food, dragon dances, and even spectacular pyroblossoms at night... But danger arises suddenly amidst preparations for the event! A young practitioner of kung fu, a brave wanderer, and a panda dragon will rise up to face a mighty enemy who's disrupting the flow of mana! A new adventurer, Su Fang, will join you during this event. Increase your friendship with him to officially add him to your roster. You can also collect blazons and emblems to get the dragon Peng Lai and the wyrmprint Dragon Dance. Here are some of the additions you can expect to see in the Skyborne Spectacle raid event. Demolish a part of the raid boss (its tail) during a raid battle to earn a large amount of blazons. In addition, there is a small chance that a golden fragment will drop. Ten golden fragments can be traded for one golden key at the Treasure Trade. Golden keys are valuable items that can unbind a 5★ wyrmprint by one stage. ・If the event ends while you are in a quest, the quest will continue until the results have been determined. You will be able to earn rewards according to the results of the quest. ・You will be able to perform blazon summons and obtain emblem rewards during this period. When you complete quests, you will increase the friendship with any temporary adventurers in your team. If you maximize your friendship with a temporary adventurer, they will permanently remain in your collection, allowing you to include them in your team after the event ends. Their level, stats, equipment, and position in your team and collection will be maintained. Note: Even if an event adventurer isn't permanently added to your collection, any items used to upgrade their level, unlock their mana circle, and promote them will not be returned. Raid battles are multiplayer co-op battles where up to four teams (16 adventurers) can cooperate against a raid boss together! There are three difficulty levels available: Beginner, Standard, and Expert. To participate in a raid battle, you must either create a room as the host or join a room as a guest. Creating a room requires otherworld fragments and getherwings. You can obtain otherworld fragments from boss battles. Joining a room requires otherworld fragments and getherwings. You must have unlocked the respective difficulty to participate in a raid battle. There is a chance that an Extra Raid Battle will appear for players who clear raid battles on Expert. The quest will disappear again upon completion. The quest will reappear when the conditions are met again. No getherwings or otherworld fragments are required. You can only participate in the Extra Raid Battle when it has appeared for you. It will disappear upon completion, regardless of whether you cleared it as a host or as a guest. Complete boss battles and raid battles to obtain peregrine blazons. Blazons collected can be used for blazon summoning to get event-specific 5★ dragons, 4★ wyrmprints, and other rewards. After obtaining the dragon Peng Lai through summoning, you can reset the contents available. From the 5th reset onwards, you must obtain all available rewards before you can reset the contents again. You can obtain rewards such as items and event-specific wyrmprints based on the total number of emblems you gather during the event. Two types of event battles will be available during the event: Daily and Limited. 1. During raid battles, you will only recover 1/4 of the amount of HP from certain skills and abilities. 2. Players must have completed up to Chapter 2 / 2-1 (Normal) of the main story to participate in event quests. 3. Players must have completed up to Chapter 2 / 2-1 (Normal) of the main story in order to play co-op. 4. If you do not maximize your friendship with temporary adventurers during the event, they will not join you after the event ends, regardless of their level or stats. 5. If a temporary adventurer joins you permanently, you will be able to read their Adventurer Story. 6. You will not be able to use blazons, emblems, or otherworld fragments obtained in this event in future events. 7. For details concerning this raid event, check the Help section on the raid event’s top page in the game. 8. The event schedule and content may change without warning.